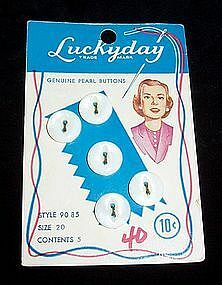 "Luckyday" is the trade mark on this card of 5 new 'Genuine Pearl Buttons' style 90 85, size 20. Original price on card is 10c but someone has since written '40' in red. Buttons are attached with wire. Back of card has yellowed with age. White glass 1 pint covered ovenware casserole dish made by Pyrex in the green 'Spring Blossom' pattern (Crazy Daisy). Use USPS link on my home page to calculate priority mail postage from zip code 43570 to your zip code. If other form of shipping of desired, please email with preference. Weight is 2 lb. 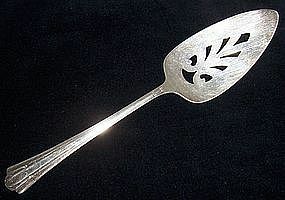 Slotted silver plate pie lifter/server made by American Silver Company. Do not know year or pattern. In good condition but shows wear where it rests on table. 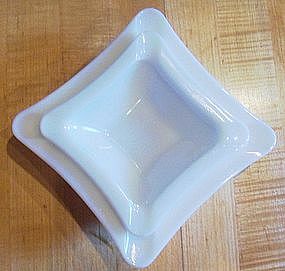 Square,stacking white milk glass ashtray set of 2. 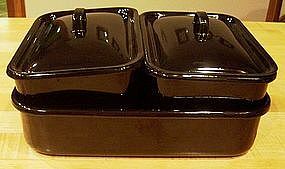 Large ashtray measures 5 7/8" and smaller one measures 4 1/2". 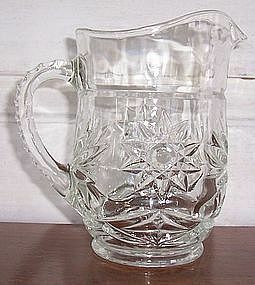 Look like the Anchor Hocking style, but have no identifying marks. Smaller one has a few very small chips on bottom edge. Use USPS link on my home page to calculate priority mail postage from zip code 43570 to your zip code. If other form of shipping of desired, please email with preference. Weight is 2 lb. 4 0z. 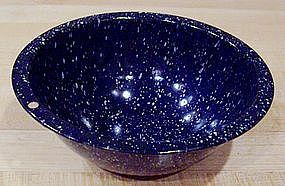 Small, navy splatterware enamel bowl measures 7" in diameter and 2 1/2" high. Has a hole in rim for hanging. Very cute little bowl in very good condition with only a little wear on bottom where it sits on the table. Use USPS link on my home page to calculate priority mail postage from zip code 43570 to your zip code. If other form of shipping of desired, please email with preference. Weight is 12 oz. 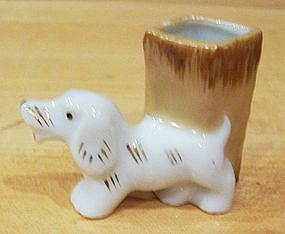 Cute little white dog with painted gold highlights stands beside a stump that holds toothpicks. Only 1 1/2" high and 2 3/8" wide. Bottom reads: Made in occupied Japan. A few imperfections but no chips. 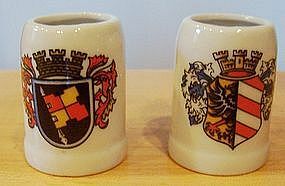 1 1/8" high and 1 1/2" in diameter mini ceramic tankard type mugs could be used as shot glasses or toothpick holders. Each has a different coat of arms on side opposite the handle. Label on bottom shows a coat of arms with two centaurs holding a shield of a lion wearing a crown with the words: "M.M.L., Made in Japan." 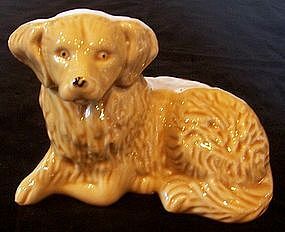 Small brown ceramic poodle is 3 1/8" high. Yellow circles are painted around his eyes. Bottom reads:'Japan.' Red terracotta-like clay. 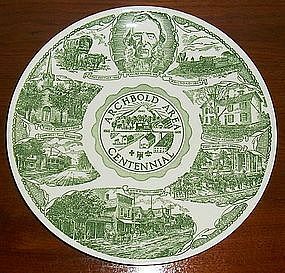 Green on white ceramic plate measures 10" in diameter and has 8 scenes around center medallion depicting 'firsts' in the Archbold, Ohio area to celebrate its centennial in 1966. Scenes are (1)First Settler in 1834, (2)first founder, George Ditto in 1838, (3)Railroad in 1854, (4)first high school in 1852, (5)first industry, logging, (6)Main Street in 1880's, (7)first Town Hall in 1905, (8)first church, St. Martins Lutheran in 1866. Made by Kettlesprings Kilns, Alliance, Ohio. 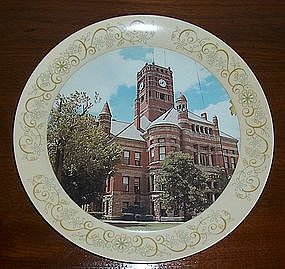 Melamine plate is 9 1/2" in diameter and has a laminated photograph of the Courthouse on the Square in Bryan, Ohio, surrounded by a beige/light apricot-colored floral print border. 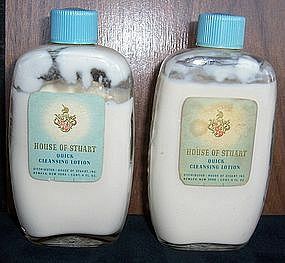 A Classic Creations by Atlas Enterprises, Atlanta, Georgia. Unsure of date but border pattern suggests 1960's or 1970's. 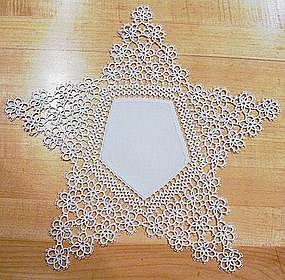 Hand tatting makes up the points of this 13" star doily with a linen body. Lightly starched. 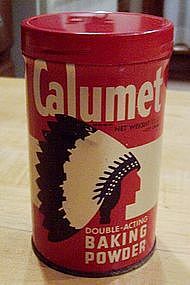 Screw-top metal tin is still 2/3 full of Calumet double-acting baking powder. 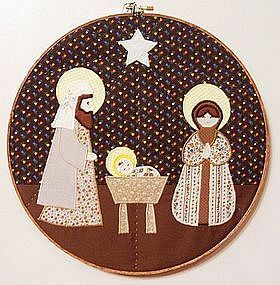 It is 4' high and 2 3/8" in diameter and originally held 8 oz. baking powder. Tin has dent on front in chief's headdress, otherwise in good condition. 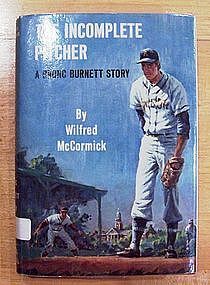 This first edition of Wilfred McCormick's book 'The Incomplete Pitcher' was published in 1967 and is in very good condition. It was a school library book and has the school's name on inside front cover with library card pocket. Dust jacket is laminated and glued to inside of book covers. Book has red cloth binding that is faded on top edge. Otherwise, in like-new condition. Media mail postage is $2.50. If other form of shipping is desired, please email with preference.